The Buick Skylark was a passenger car produced by the Buick division of General Motors. The model was made in six production runs. In each run, the car design varied dramatically due to changing technology and tastes, as well as new standards implemented over the years. The 215 cubic-inch-displacement aluminum block V-8 engine was discontinued, and the associated tooling eventually was sold to the British manufacturer, Rover. That company would produce the engine in several versions for use in its sedans and Land Rover sport utility vehicles and trucks. The standard Skylark engine was now a 225 cubic-inch all cast iron block V-6 with a Rochester 1-barrel carburetor that generated 155 horsepower (116 kW) at 4400 rpm. 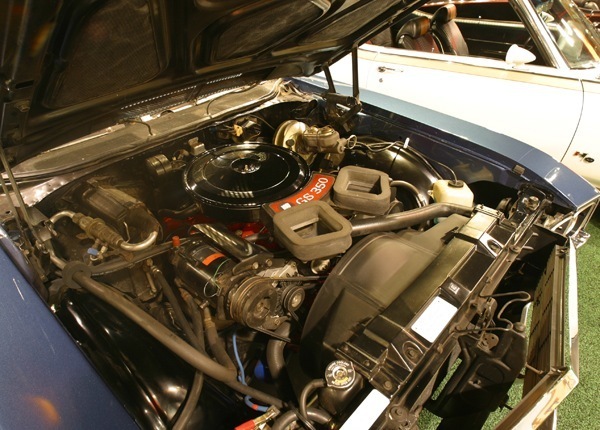 This engine was introduced in 1964, very similar to the earlier V6 beginning with the 1962 model year which had a smaller displacement of 196 cubic-inch. This engine was basically a Buick V-8 300 CID engine with two cylinders sawed-off. The optional engine was a 300 cubic inch cast iron block and heads V-8 with a Rochester 2-barrel carburetor that generated 210 horsepower (160 kW) at 4600 rpm. An optional V8 version of the 300 CID engine was offered with aluminium heads with a 11:1 compression and a 4-barrel carburator generating 250 hp (190 kW). A long throw 4 speed hurst shifter was available. In addition to the two-door convertible and hardtop coupe body-styles, a Skylark four-door sedan became available for the first time. Skylarks, however, would continue to have higher levels of exterior and interior trim compared to the Special and Special Deluxe from which they were derived. All-vinyl bucket seats would be standard on the convertible and optional on the hardtop coupe. The sedan would come with cloth-and-vinyl seats standard, and an all-vinyl interior would be optional. The Sylark Coupe had a lower profile, sitting lower to the road then the Buick Special models. The Skylark in 1964-1965 were available in a pillar-less coupe (Hard Top) two-door sedan version, as the Specials and Special Deluxes only came in pillared coupe versions. Beginning with the 1964 model year, a two-door sedan (pillared coupe) was added to the Skylark lineup. 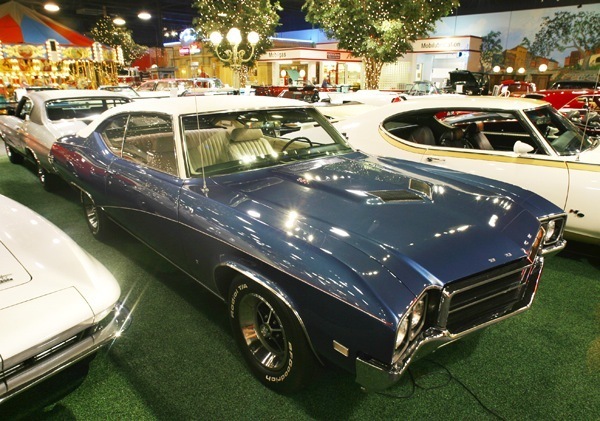 Inspired in no small part by the sales success of the 1964 Pontiac Tempest LeMans GTO, the Gran Sport option became available in mid 1965 for the three two-door Skylark models. The Gran Sport option featured Buick’s 401 cubic-inch-displacement V-8 engine using a Carter 4-barrel carburetor that produced 325 horsepower (242 kW) at 4400 rpm (it was listed as 400 cubic inches in sales literature, supposedly to escape a General Motors mandate that engines larger than 400 cubic inches should not be used in intermediate-sized cars). Other Gran Sport features were unique Gran Sport badging, a heavy-duty radiator, and dual exhaust. In the 1966 model year, the four-door (pillared) sedan was replaced by a four-door (pillarless) hardtop sedan. The convertible, hardtop coupe, and two-door sedan continued to be available. The four-door sedan would rejoin the lineup for the 1967 model year, making a total of five Skylark body styles. Beginning with the 1967 model year, only the Skylark two-door sedan would be available with the Buick V-6 engine as standard. The 300-cubic-inch V-8 would be standard on all other models, with the exception of the four-door hardtop sedan, which came with a 340 cubic-inch-displacement V-8 engine using a Rochester 2-barrel carburetor and producing 220 horsepower (160 kW) at 4400 rpm. 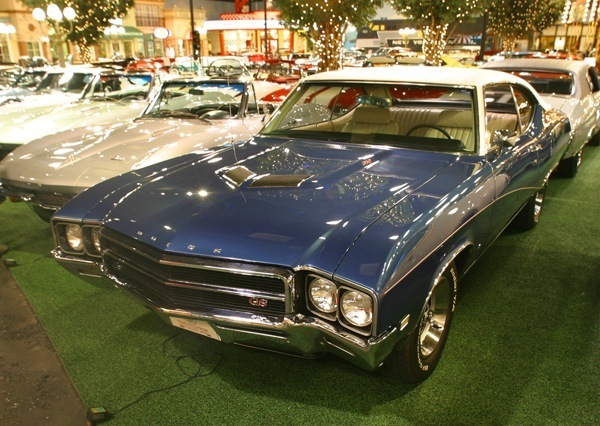 The previous Buick Skylark Gran Sport was relabeled as the Buick Skylark Gran Sport 400 to reflect its engine. A new model was the Buick Skylark Gran Sport 340, also using the 340-cubic-inch V-8 that was standard on the Skylark four-door hardtop. The Gran Sport 340 was available only as a two-door hardtop coupe. 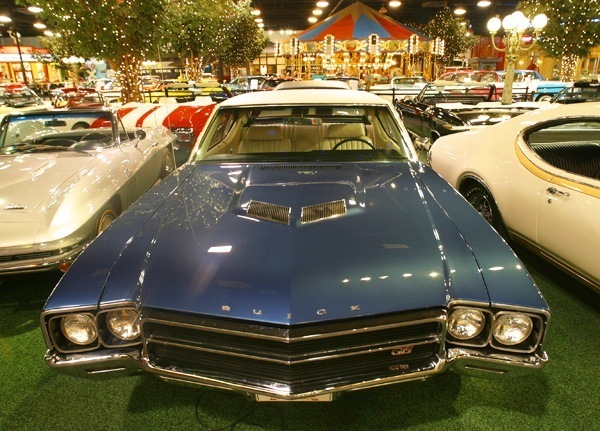 The 1968 model year was one of significant change for the Buick Skylark. Although still using the same basic chassis, all of GM’s mid-sized cars adopted a policy of using two different length wheelbases. Two-door models used a shorter wheelbase of 112-in, while four-door models used a longer wheelbase of 116-in (the Buick Sportwagon and Oldsmobile Vista-Cruiser used an even longer wheelbase of 121-in). All of GM’s mid-sized cars received all-new sheet metal. The Gran Sport, previously an option package available on the Skylark, became a separate series. In a reshuffling of models in the lineup, the Special Deluxe replaced the previous Special. The Skylark nameplate was shuffled down a notch to replace the previous Special Deluxe. The previous Skylark was replaced by a new Skylark Custom. The previous V-6 was discontinued and the associated tooling was sold to Kaiser Industries, which used the V-6 in its Jeep trucks and sport utility vehicles. 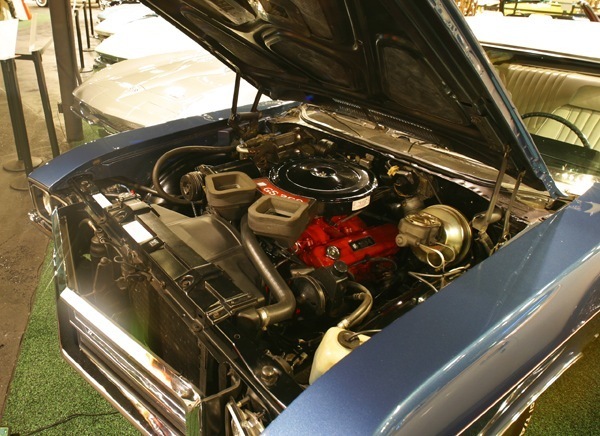 The base engine in Buick Skylarks (and Buick Special sedans) became a 250-cubic-inch inline six-cylinder engine using a 1-barrel Rochester carburetor (borrowed from Buick’s sister Chevrolet division) that produced 155 horsepower (116 kW) at 4200 rpm. 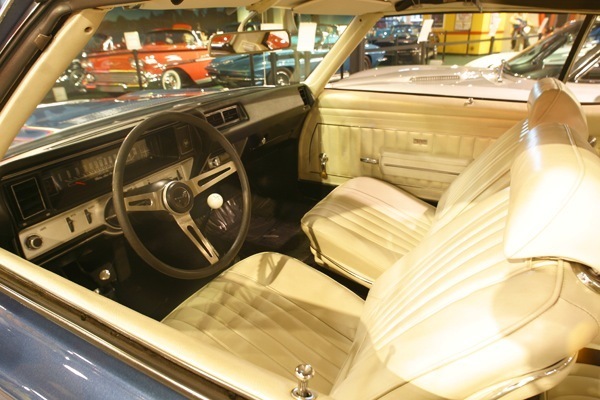 Optional on the Skylark and standard on the Skylark Custom was a new 350-cubic-inch V-8 engine using a 2-barrel Rochester carburetor that produced 230 horsepower (170 kW) at 4400 rpm. This engine was based on the previous 300- and 340-cubic-inch-displacement V-8 engines. The Buick Special name was dropped after the 1969 model year. 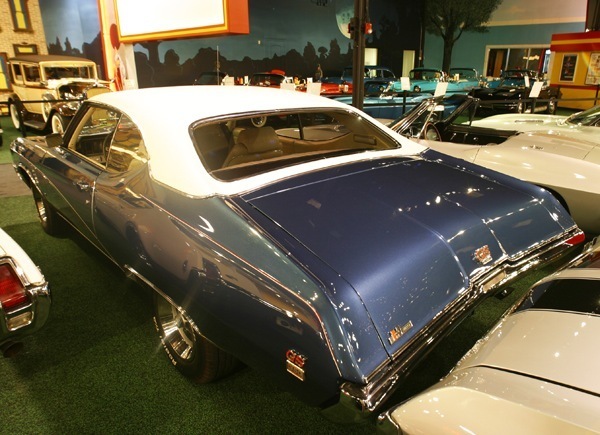 For 1970, the mid-sized Buicks once again received new sheet metal and the Buick Skylark name was moved down another notch, replacing the previous Buick Special. The Skylark became the entry-level Buick available in two- and four-door sedans with the 250-cubic-inch inline-6 as standard and the 350-cubic-inch V-8 (260 horsepower at 4600 rpm) available as an option. Replacing the previous Buick Skylark was the Buick Skylark 350, available as a two-door hardtop coupe or four-door sedan with the 350-cubic-inch V-8 as standard equipment. 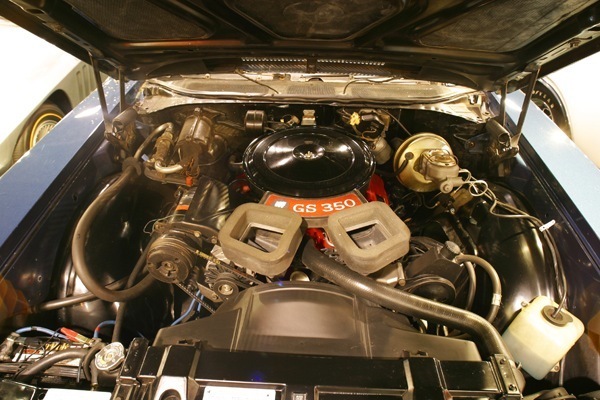 This 350-cubic-inch Engine was a different design then the Chevy’s 350 CID engine (4.000 in x 3.48 in)the Buick design had a longer stroke and smaller bore (3.80 X 3.85 in) allowing for lower-end torque, deep skirt block construction, higher nickel-content cast iron, 3.0″ crank main journals, and 6.5″ connecting rods, the distributor was located in front of the engine (typical of Buick), the oil pump was external and mounted in the front of the engine, the rocker arm assembly had all rocker arms mounted on a single rod and were not adjustable . The Skylark Custom continued to be available, also using the 350-cubic-inch V-8 as standard equipment and still available as a two-door convertible coupe, two-door hardtop coupe, four-door hardtop sedan, and four-door sedan. Buick Gran Sport models continued to be available as a separate series. The Buick Sport Wagon name was now used on a conventional four-door station wagon that no longer featured a raised roof with glass panels over the cargo area, or a longer wheelbase, as in the past. It now used the same 116-in wheelbase as the Buick Skylark four-door sedan and the now-discontinued Buick Special four-door Station Wagon. It became, in effect, a Buick Skylark four-door station wagon in all respects but the name. 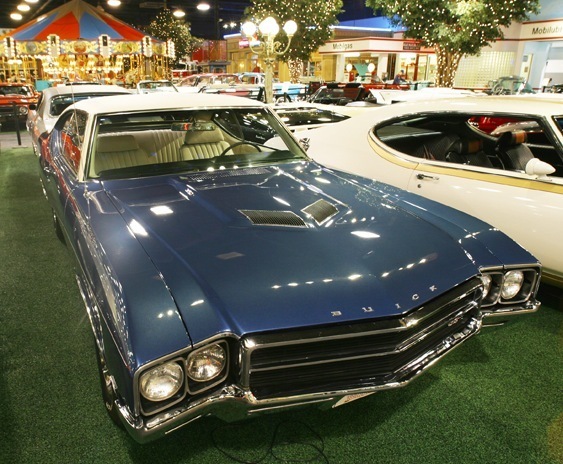 For the 1971 model year, the base Skylark was available only with the inline 6, now only putting out 145 horsepower (108 kW) due to emission control devices, but in a two-door hardtop coupe body-style (in addition to the previous two- and four-door sedans. The Skylark 350 had a V-8 engine that put out only 230 horsepower (170 kW). It was now available as a two-door sedan in addition to the previous two-door hardtop coupe and four-door sedan. 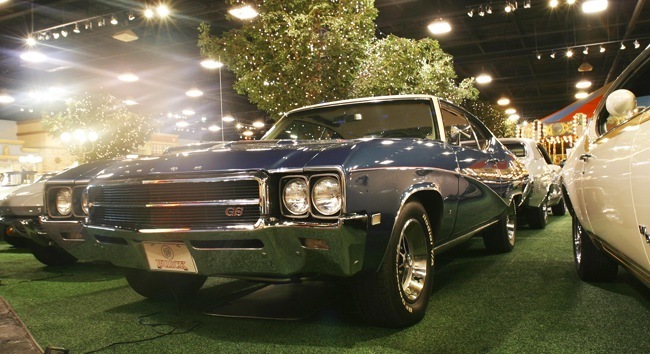 1972 was the last model year for the mid-sized Buick Skylark. During this model year many pollution controls were added to the Engines, Compression was lowered, engines had to accept leaded and unleaded gas, and spark timimg was retarted (no vaccuum advance in lower gears)while driving in lower gears to reduce emissions. 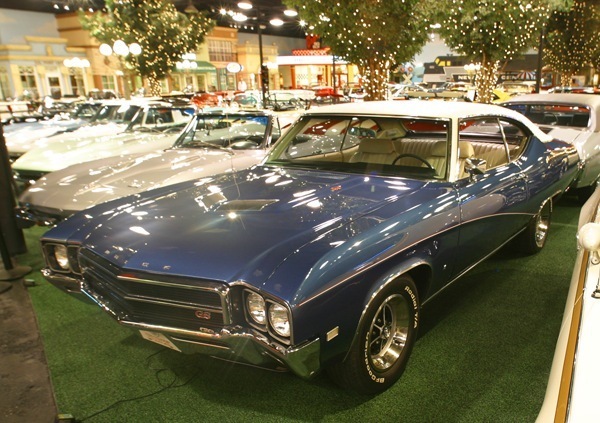 For 1972, the base Buick Skylark used the 350-cubic-inch V-8 with the 2-barrel Rochester carburetor (now putting out 145 horsepower) as standard equipment. A new federally-mandated system to calculate power was put into effect that year, and the actual engine performance was probably comparable but slightly lower because of pollution controls in the 1972 model year to the 230 horsepower (170 kW) that was listed for the previous year. The Skylark 350 now used a version of the same V-8 engine as the base Skylark, but with a 4-barrel Rochester carburetor that generated 170 horsepower (130 kW). 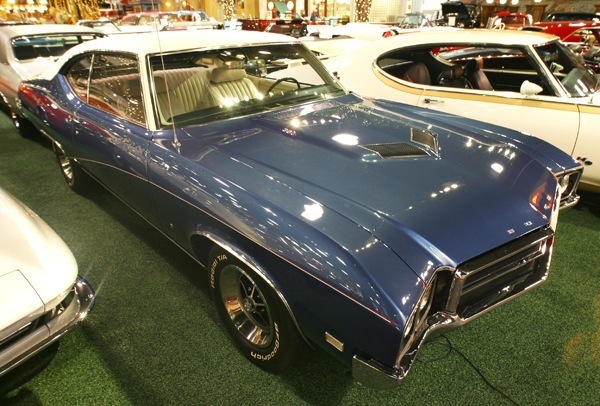 An interesting limited-production model was the 1972 Buick Skylark 350 Sun Coupe, which was a Skylark 350 Hardtop Coupe that featured a sunroof and vinyl covering over the front portion of the roof (a landau design). Skylark Customs were available with the same 350-cubic-inch V-8 engines available in the basic Skylark and the Skylark 350. The Custom had an upgraded interior and dash with some extra chrome. Convertibles only came in the Skylark Customs and the Skylark 350’s. For the 1973 model year, the Buick Gran Sports, Skylarks, and Sport Wagons would all be replaced by the new mid-sized Buick Century. Since Centuries were available with Gran Sport trim, the Gran Sport name was once again reduced to being an option package.